Congratulations on being accepted into the AAMPLE program! NOW the hardwork begins. Outlines and PowerPoints on Negotiable Instruments and the 4th Amendment are just a click away! Your VISION is within reach! If law school has been a dream that you always wanted to acheive, then dont let a low LSAT score and a low gpa stop you. Standardized exams have been used for many years as away to test your knowlwedge and compare your score to other students. Many students perform very well in classes, but don't do as well as they would've liked on the standardized exams. Having a low LSAT score and a low gpa doesnt mean that you won't perform well in law school. There are many facvtors that contribute top low LSAT and gpa scores. For whatever reason you didnt do as well as you would've liked, you still should have the opportunity to prove yourself in law school. Good grades in college and a low LSAT score will make it almost impossible for some to be excepted to law school. The LSAT is waht is used as a selection tool for law schools, but it doesnt measure your work ethic and how hard you have worked while you were in college. 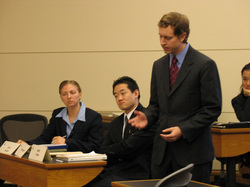 The AAMPLE program is an opportunbity to prove yourself to the admission board and earn your way into law school. Without this opportunity some stuidents may find it very difficult to enter law school. The two courses that you will be taking during the program consists og Negotiable Instruments and the Fourth Amendment. These two classes will measure your ability to succeed in a rigorous law school style curriculum. Success in these two courses allows you to gain admission in the next semester in law school. This packet will give you the necessary tools to help you succeed in the AAMPLE program and gain admission into law school!